Physical Therapist ~ Missy is a 2007 graduate of the University of Minnesota where she earned her Bachelor of Science in Kinesiology and her Doctorate of Physical Therapy. She grew up in Green Bay, Wisconsin, and therefore is a Green Bay Packer fan. Missy moved to Clarksville in January 2010 to be with her husband, Jake, who is based at Fort Campbell. 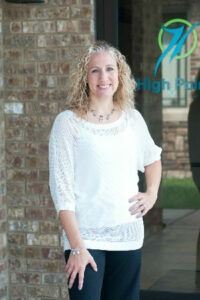 Missy joined the High Pointe Rehab team in January 2011 and shortly thereafter became the proud mommy to two young boys, Mason and Jaxon. Missy loves spending time with her husband and her dog Midget, an American Mastiff. She also enjoys reading, scrapbooking, and exercising.